This is one of my latest PhotoShopped images. 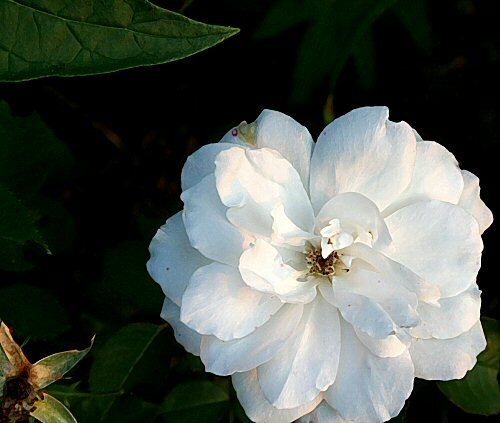 The poor rose is one that was given to Elly when we lived in Cortland as a gift from a mother she helped deliver. I abused it there, moved it here, and have continued to abuse it. Wherever I put it, it always gets smothered by neighboring perennials, and it’s never gotten more than a foot high nor had more than a couple stems. But every now and then, I’ll notice it’s struggled to put out a flower or two, and they’re really nice. 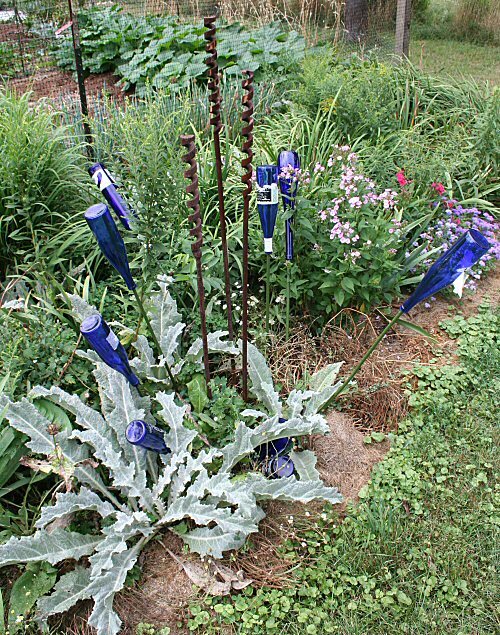 Vignette with blue-bottle and ship-building auger ‘flower’ and Scotch thistle (Onopordum acanthium), the greyish plants in the foreground. The Scotch thistle is only supposed to be hardy to Zone 6, but three plants I grew from seed a few years ago have seeded themselve around pretty well. But that’s OK, I love them.